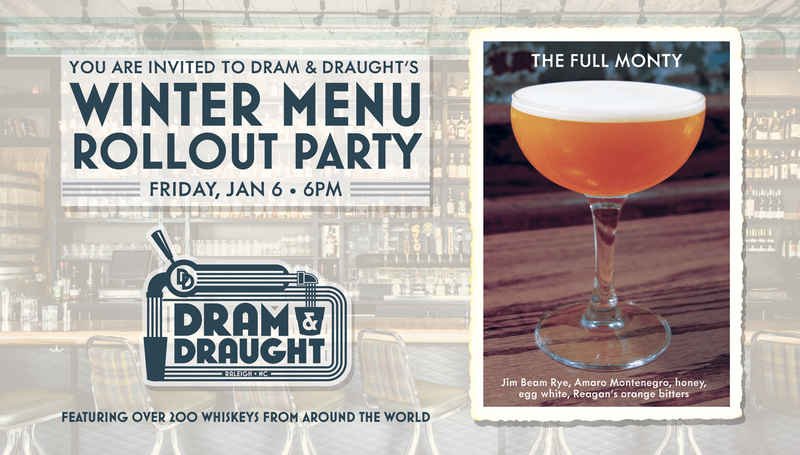 On Friday evening, the gang at Dram & Draught will debut their winter cocktail menu and are hosting a party to roll out the new specialty concoctions. When: Friday, January 6, 2017 – Beginning at 6 p.m. The menu features fun seasonal additions like “Canadian Tuxedo” (Wiser’s Deluxe Canadian Whisky, maple syrup, lemon, Fee Brothers black walnut bitters, orange wedge) and “Chock Full o’ Nuts” (Ezra Brooks Bourbon, honey, cold brew coffee, Bonal, lemon twist), as well as mainstays like an Old Fashioned (Evan Williams 1783 Bourbon, Angostura bitters, simple syrup, orange twist) and the French 75 (Gordon’s Gin, lemon, simple syrup, sparkling wine). Want to RSVP or easily share this event with friends? You can do that here on Facebook.